The Laser Speed Light is another beautifully designed piece of kit from Petzl. It’s an ice screw comprised of a durable steel drill, a stout anodized aluminum tube, a compact aluminum hanger, and a foldable lever. The “LSL” represents a minimal weight impact for such a high level of insurance in the mountains. The aluminum tube is anodized for corrosion resistance which increases durability in the long run, but also makes it easy to spot when you drop it. (Pro-tip: don’t drop it.) The foldable lever saves space, increases leverage for faster drilling, and is color coded so finding the proper length for the job will be easy as colored pie. The Laser Speed Light features a steel drill that provides the best balance of weight and durability while still offering secure bite when planting an anchor. The hanger is small and compact for accurate and tactful placement in tight spots, which also contributes to the weight savings and precision of the screw. One of the easiest ice screws on the market to start threading, the Petzl Laser Speed Light is a desirable companion when your slope angle exceeds your steep-skiing capabilities. Available in 13cm, 17cm, and 21cm lengths. 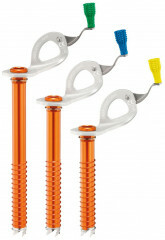 Steel drill is durable and easy to sharpen with Petzl’s patented Sharpening Reserve. Small aluminum hangers are easier to place in challenging ice. Foldable lever increases leverage and contributes to the easy handling. CE and UIAA certifications imply the highest level of quality for climbing and mountaineering equipment. Color-coded levers for quick recognition. Petzl Speed Lights are by far the best screw on the market, expensive albeit but the lightest and easiest to start. 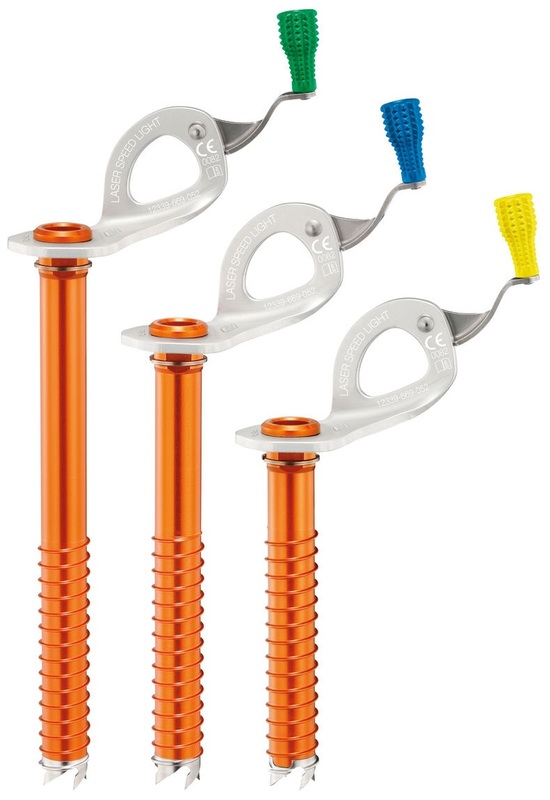 Word has it that Black Diamond is coming out with a aluminum screw that is lighter, but they're sticking with their old tooth profile so Petzl's will still be easier to start. My original concern was the interface between the aluminum tube and the steel teeth (this connection point wearing out, differing expansion/contraction rates cracking the tube, etc) I have had none of these issues. Petzl had issues with the tube cracking originally but looks like they've solved it. One last thing I really like about these screws is the crank, it's positioned farther out than the competition and results in a more inuitive crank pattern as well as greater mechanical advantage against the ice. Petzl screws are amazing! Compared to the competition they are hands down the best (in my opinion, not saying they couldn't be even better). Compared to all the screws I've used, these bite the best while being place and go in fastest. Also the weight on these is amazing with out much of a durability compromise. The handle is further from the screw shaft compared to other screws and this means you must to more rotations by hand before using the crank or you'll break the ice around the screw. What is 12 + 2?